So far, you've looked at importing video as a file. The process of importing video from a camera with a hard disk and a USB socket, or a model that records onto memory cards, is similar to importing from DVD. However, many digital video cameras don't use file-based storage. The Digital Video (DV) standard has been around since the mid 1990s and is a linear format, not a random-access format like video files on a hard disk. DV cameras use a variety of tape cassette sizes, most often in the MiniDV version on affordable equipment. A few Sony camcorders use a similar format called Digital8, but the cassette size is larger than MiniDV. Some broadcast camera equipment uses other variants of DV called DVCAM (Sony) or DVCPRO (Panasonic); those cassettes are larger still. Because DV is a linear format, tapes must be played back into the computer, or captured, before editing can begin. Almost all MiniDV camcorders (or their docking stations) have an IEEE 1394 socket to enable direct digital transfers of video material from the tape. If you have an older, analog camcorder that uses Video8, Hi8, or VHS tapes, you can usually capture video using a video output socket on the camera, an appropriate cable, and a specialized PCI card fitted to your computer. If you're running GNU/Linux, you should check driver support on the www.linuxtv.org site before purchasing an analog capture card, because many models are only supported under Windows. The driver problem may affect users of Apple's OS X or Windows 7 too. Because analog video capture is considered old-fashioned now, some PCI cards work only under obsolete versions of Windows, such as Windows XP. Not all video-editing programs have features for getting video from a camcorder tape onto your computer. 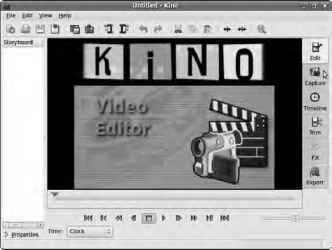 For that task, you can use Kino (GNU/Linux; www.kinodv.org). This deceptively simple DV capture and editing tool for IEEE 1394 hardware works well, as long as the camera you're using is supported (see Figure 11-16). Figure 11-16. Kino is a useful tool for capturing video from DV cameras. Kino is available ready-packaged for most GNU/Linux distros, but it's worth checking on the Kino web site if your distro of choice ships the latest version of the application. Ubuntu users can easily install Kino using the Add/Remove Applications tool, which places the program on the Sound & Video menu. Before you run Kino for the first time, connect the camera or docking station to the GNU/Linux machine with a FireWire cable, and switch the camera on. If you don't have FireWire ports on your motherboard, then a PCI card for IEEE 1394 is a low-cost upgrade. Older laptops can be FireWire enabled with a PCMCIA card, but not all recent laptops have a PCMCIA socket. Again, checking driver support in GNU/Linux for any new piece of hardware is a good idea, particularly if it's an obscure device. After Kino starts, click the Capture tab at right in the GUI. If a tape with a recording on it is loaded in the camera, you should see some video in Kino's main window. Kino has transport remote controls that allow you to rewind, fast forward, and otherwise manipulate the camcorder tape, so you shouldn't need to touch the camera during the capture process. Before you click the Capture button below the main viewing window, choose Edit > Preferences and click the Capture tab. Specify the file type you require; in this case, click the Raw DV radio button (see Figure 11-17). 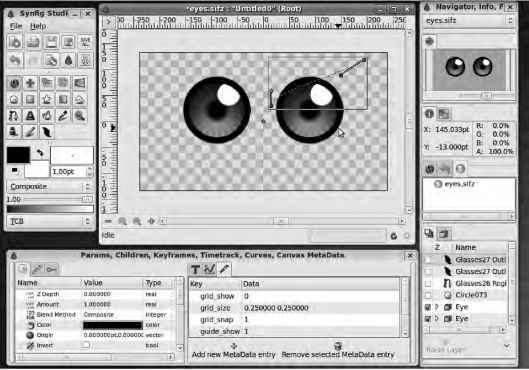 The DV AVI Type 2 option is said to provide better compatibility with Windows video-editing applications. Figure 11-17. Set Kino's preferences before you attempt your first video capture. It's a good idea to check the Auto Split Files box, which gives you a separate DV file for each continuous shot on the camcorder (not the same thing as a separate file for each still frame). In a drag-and-drop environment, it's much easier to make editing decisions about individual shots than about long, unbroken files. Personally, I also set the Put Timestamp in File Name option, because it makes it much more practical to manage a large number of individual files. If the clock is set correctly on your camcorder, each DV filename is then tagged with the date and time of the original shot. 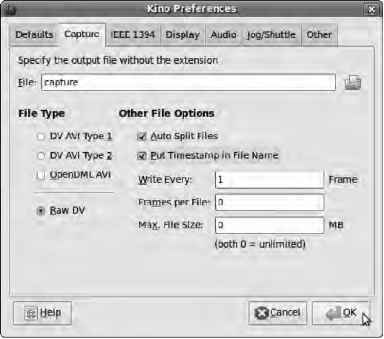 If you click the Capture button and all goes well, the directory specified in the Capture tab of Kino's preferences dialog begins filling with DV files. Note that the process happens in real time, so a standard 60-minute MiniDV tape takes an hour to capture. You need around 13GB of hard disk space for each 60 minutes of DV captured. It's well worth checking out Kino's editing, effects, and export features, because it may have all you need to prepare a simple YouTube-style video. A comprehensive user manual is available at www.kinodv.org/docbook/.